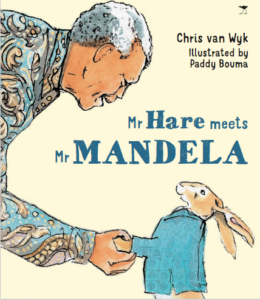 Hare Meets Mr Mandela is one of the last stories Chris van Wyk wrote before he died and it originally appeared in the Sunday Times Storytime: 10 South African Stories for Children. Mr Hare finds a note on his doorstep. When he turns the note over he sees Mr Mandela’s face and decides to brave the big city of Johannesburg to return it to Mr Mandela. But Mr Hare cannot read and he comes across many people along the way who want to get their hands on Mr Mandela’s money. Mr Hare also cannot work out why the note keeps changing colour! “The next morning, Mr Hare was awakened by a thud on his doorstep. He peeped outside. Mrs Elephant wasn’t there. But there was a big envelope on his mat. He went out and looked around to see who had brought it. There was no one in sight.